Posterior tibial tendonitis is characterized by inflammation and pain at the posterior tibial tendon at the back of the inner ankle bone. This is the tendon attachment of the muscles of the leg to the inner foot, and it is important in turning your foot inward, standing on your toes, and in the pushing-off phase of running or jumping. It also supports the arch of the foot. These muscles can be overworked if the foot isn’t hitting the ground in proper alignment. If the foot hits the ground more on the inside (pronation), the posterior tibial muscle must work harder and this can lead to an overuse injury. It can also be caused by a sudden increase in the amount or intensity of an activity such as running, a direct injury to the lower leg, ankle or foot, or due to a return to activity following a previous injury with incomplete rehabilitation. The Physical Therapists at Apple Physical Therapy will design a personalized treatment plan specific to you and your injury that will include range of motion, stretching and strengthening exercises to improve mobility and strength in your posterior tibial tendon, ankle and leg to allow you to return to normal daily activity. We will include balance training exercises to improve ankle stability and leg strength. Manual therapy techniques such as massage to the posterior tibialis muscle and tendon and stretching of the surrounding muscles to restore normal motion of the leg and to facilitate healing will be included. If indicated we will include the use of the Graston Technique, instrument assisted massage to help break down scar tissue and muscular restrictions. 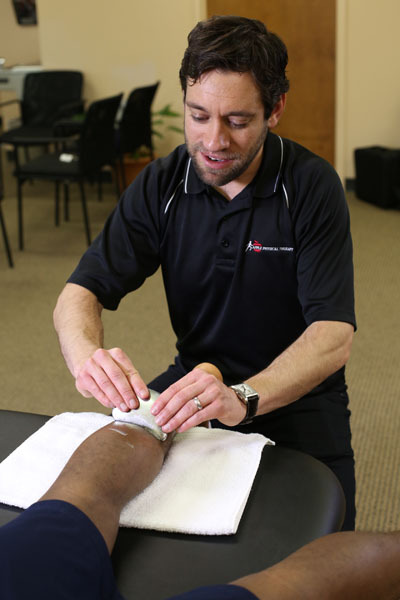 If necessary, your PT may elect to use modalities such as ice, heat, and/or ultrasound to decrease swelling, pain and ready the body for exercise.